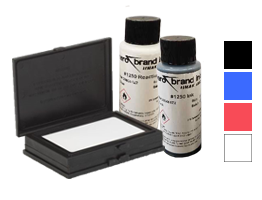 MARK II Reactivator rejuvenates the ink in a dried out stamp pad or you can easily clean the stamp pad surface with a few drops of reactivator. For use with industrial ink only. 2 oz refill. Marks various non-absorbent surfaces, including plastic, metal, foil, electronic parts, glossy surfaces, glass, and more. Ink is USDA approved and meets TT-I-1795A Type I, and AA-208 Type I (will work for Type II). Dries in 10-15 seconds.